South African Airways (SAA) and Portuguese national carrier TAP Portugal will expand their current code-share service between Portugal and South Africa effective 7 March. The new services, available now for booking and purchase on both Star Alliance partners, will be in addition to the current code share services offered via London (Heathrow) on SAA-operated routes between Johannesburg, Cape Town and London, and on TAP Portugal-operated routes between London and Lisbon. SAA customers will benefit from new connecting code share services beyond Lisbon to other Portuguese destinations within the TAP domestic network, including Porto, Faro and Funchal (Madeira). TAP customers will now benefit from connecting flights beyond Johannesburg to other South African cities in the SAA domestic network, such as Cape Town, Durban, Port Elizabeth and East London. The code share has also been expanded to include the West African connecting point of Accra in Ghana. TAP will operate the Lisbon – Accra route with SAA as the code share partner, while SAA will operate the Accra – Johannesburg route with TAP Portugal as the code share partner. As members of Star Alliance, TAP Victoria Members can earn miles when flying on qualifying flights, with a 200 percent Class-of-Service Bonus when flying in Business Class. All miles accrued count towards earning status. SAA Voyager offers its members an added advantage towards earning and spending their Voyager Miles across the network. Top tier members can also enjoy access to Star Alliance lounges wherever applicable. In addition, TAP and SAA offer reciprocal frequent flyer benefits, including lounge access. Customers of both airlines will also enjoy one-ticket itineraries and through baggage check. South African Airways (SAA) is the leading carrier in Africa, serving 20 destinations across the continent, as well as major destinations within South Africa, from its hub, Johannesburg. It is a member of the largest international airline network, Star Alliance. SAA’s core business is the provision of passenger airline and cargo transport services together with related services, which are provided through SAA and its four wholly owned subsidiaries: SAA Technical; Mango its low cost carrier; Air Chefs, the catering entity of SAA and South African Travel Centre (SATC). SAA CEO Siza Mzimela is the first woman to be appointed to the IATA Board of Governors in its 67 year history. SAA is the winner of the 'Best Airline in Africa’ Award in the regional category for 9 consecutive years and the winner of ‘Service Excellence Africa’ for two consecutive years. Mango and SAA hold the number one and number two successive spots as South Africa’s most on time airlines. 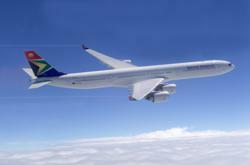 For more information please visit http://www.flysaa.com. TAP Portugal is the leading Portuguese airline, in operation since 1945 and member of Star Alliance, the global airline alliance to offer customers worldwide reach, since March 14th, 2005. Its hub in Lisbon is a key European gateway at the crossroads of Africa, North and South America, where TAP stands out as the international leading carrier in operation to Brazil. The company’s network comprises 75 destinations in 34 countries worldwide. TAP currently operates 2,250 weekly flights in average on a modern fleet of 55 Airbus aircraft, to which add some 16 aircraft operating in PGA colours, TAP regional carrier, thus adding up to a 71 aircraft fleet in the whole. In the pursuit of its customer focused policy, TAP continuously strives to deliver safe, reliable and upgraded products & services, tailored to meet customers’ expectations. Retaining the Portuguese character of the Company’s brand and quality service as the basic concept has been the main driver of TAP strategy in most recent years. Recognized and awarded as the World’s Leading Airline to Africa by the World Travel Awards in 2011, TAP was also awarded the WTA World’s Leading Airline to South America in 2009, 2010 and 2011. The company was also honoured by UNESCO and by the International Union of Geological Sciences with the IYPE “Planet Earth Award 2010”, in the category of “Most Innovative Sustainable Product”, in recognition for the achievements of the company’s Carbon Offset Program, the first one launched worldwide in partnership with IATA. Voted Best Airline in Europe by the Global Traveler, USA, in Dec. 2011, TAP was also awarded as Best Airline by Condé Nast Traveller Magazine in April 2010, For more information, go to http://www.flytap.com.